Fran's House of Ayurveda: What is PITTA? The three Doshas - vata, pitta and kapha - are based on the 5 elements: air, space/ether, fire, water and earth. Pitta is the dualistic combination of fire and water, with an emphasis on fire. The nature of both these elements is dynamism, ferocity and passion, and together they are hot and wet; volcanoes are Pitta, as is the Sun. The nature of fire is to consume, hence Pitta is the ruler of digestion. Pitta is digestive fire, which makes Pitta types generally ravenous and have no problem eating lots of unhealthy food. 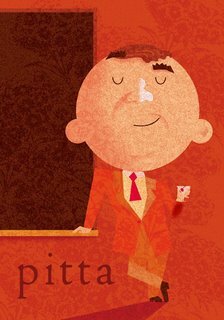 Pitta is also mental digestion, making Pitta types acutely intelligent, have sharp wits and a great memory -- but the heat of fire also makes them argumentative and hot-headed. If your constitution is predominantly Pitta, it means fire dominates how your mind and body function. Characteristically, Pittas tend to have a medium, muscular build with moles and freckles, and may have fair or reddish hair or skin. Pitta is transformative and strong, so Pittas tend to be athletic, and have tempers that flare up out of nowhere. Their fire and water makes them prone to acne but have excellent digestion and elimination. Not surprisingly, heartburn may be the only digestive complaint. Because Pittas are all fired up, the best activities for you are calm, slow, cooling ones. Meditation can soothe you, getting plenty of rest is important, and gentle activities like yoga, walking and swimming are great. Pittas like to take the lead and be right all the time, so exercising humility is challenging but an excellent and important way to balance your constitution and get more joy out of life. Take time for leisure and don't overwork. Ease off of the things that aggravate your Pitta fire, such as cigarettes, alcohol, spicy or fried food, and competitive activities. Pitta's natural gift to society is their great intellect. J has been raving about your new blog so I had to check it out for myself.I'm pita bread by the way! !